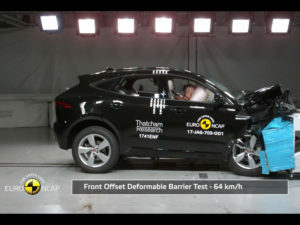 Carmakers have been praised for their work in vehicle safety as latest Euro NCAP ratings show all eight vehicles achieved five-star results, supported by standard-fit Autonomous Emergency Braking (AEB) systems. The results include three new vehicles – the Jaguar E-Pace, DS 7 Crossback and Mercedes X-Class, with the latter setting some of the highest-ever scores for the pick-up sector – as well as the latest-generation Porsche Cayenne, BMW X3, Subaru XV and Impreza. The latest ratings also include the re-tested Honda Civic, which now gains five stars following an initial four-star rating due to a curtain airbag deployment issue. Thatcham greeted the results as it praised the carmakers’ use of standard-fit AEB and also noted that both the Honda Civic and the Subaru Impreza come with standard-fit lane keeping aids, while the Impreza also comes with AEB with pedestrian detection. From next year, Euro NCAP will introduce testing on auto brake systems that can detect and mitigate cyclists as it increases its focus on automated vehicle functions.